Pain is experienced in many ways: the available adjectives are dull, throbbing, achy, numbing, sharp, but today I'm gonna use excruciating. 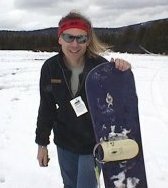 This is Valentines' Day, 1998, and it's the first time that I've ever been on a snowboard. It won't be the last, either, but this is one that I'll always remember. Friday Afternoon First of all: Why am I motoring into the wilderness of Arizona this late Friday instead of anticipating spending Valentines' Day with my beloved? Well, first off, no beloved. Secondly, this is the first time that the lab has given its employees the Presidents' Day holiday so this is a very rare 3-day weekend. And I need the break. This is also Friday the thirteenth. That in itself lends a special aura to the whole affair. I belatedly left LA, held back from my nominal early afternoon departure by problems with some spacecraft hardware at work. I was supposed to and had been looking forward to meeting an e-friend in Phoenix for dinner, but due to the late departure that sadly ended up being a wash. By the time I arrived at the I17/I10 interchange just west of downtown Phoenix, it was 11:30pm and I was still nearly two hours from my final destination, Flagstaff. 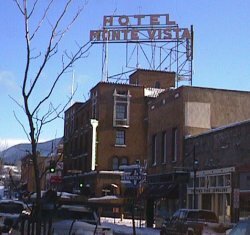 Flagstaff is one of the crown jewels of Arizona, and the nicest town in North America. 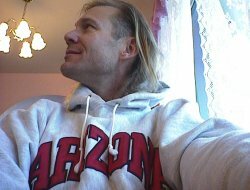 Centrally located to all of my haunts (Grand Canyon, Skull Valley, Cedar Mesa, Poison Spring Canyon, No Mans Mesa, Lake Powell, Tarantula Mesa, Paria River, Skeleton Mesa, Marble Canyon, Verde River valley, Bloody Basin, Coconino Plateau, Dark Canyon Plateau, Little Death Hollow, Roof Butte, the Chuskas and the Lukachukais, the Mogollon Rim, Painted Desert and Lithodendron Wash, Secret Mountain, Crazy Basin, Defiance Plateau, the high peaks of the Kachina Wilderness, etc., to name a few), I always end up gravitating to Flag every vacation. So what better a place to learn snowboarding than my favorite place, thus affording me extra karma just in case. And, apparently, I would need that! 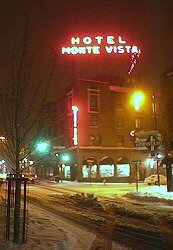 I'm staying at the Monte Vista Hotel, an old dive in the even older downtown. 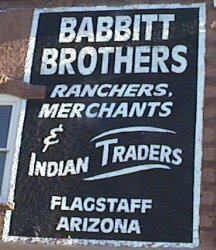 Built somewhere around 1925, it was home to many famous travelers who rode the Santa Fe Super Chief across the southwest either on their way to Los Angeles or Chicago. The Monte Vista is quite a place. 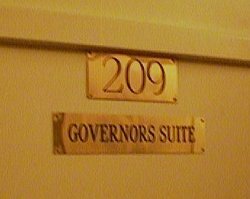 I am staying in the Governor's Suite, Room 209, which fronts on San Francisco Street immediately north of the intersection of Aspen, and with a fine view out the window of Babbett Brothers emporium across the street. The paint and plaster in the room is bubbled, cracking and peeling, and I help it along a little occasionally by pulling off a particularly huge piece of cracked plaster/paint laminate. The bed is ok, the sheets are washer-worn but clean and clean-smelling, the bedspread is unraveling, but in a twisted way it's a cool place to stay. The second-hand smoke from the room next door though is a bit annoying the whole time. The carpet is stained and worn, the edges curling up here and there, the TV is working good enough to get the weather forecast and relentless hours of Hard Copy and Entertainment Tonight or something like that. The phone is attached to the wall, and requires a little surgery before I am able to make use of the phone line to collect my e-mail via the computer. The bathroom is clean, a little small, but with plenty of hot water and the linen is changed every day, so I can survive that. There's a electric baseboard heater that I tend to leave on the whole time, as it doesn't put out too much heat, and it takes a long time to get the room to be a reasonable temperature. All in all, I probably won't stay here again, but the experience is one that must be had. The thing that has always drawn me to it is the big neon sign up on the roof, the one that can be seen from across town. Flag has a few of these, but this is the largest. According to a friend of mine, the hotel has several haunted rooms and she has included it on her company's southwestern tours along with other spots like Area 51 in Nevada. Pretty august company if you ask me. If I had known about the haunted rooms beforehand, I would have made sure to ask for one! After that long drive and late arrival, morning comes early, especially when there's a 10am snowboard class that I've gotta make. So, getting out of my hotel around 9, I whipped on over to the awesome Macy's, a great little bakery/coffee house/soup spot over on Beaver St. Getting a triple Cappucino del San Francisco, a blackberry danish and a blueberry scone (both quite large) to go, I jacked into the highway up to the Arizona Snowbowl, the local ski park. The morning is splendid, the sky clear and deep blue with only a hint of clouds to the west. 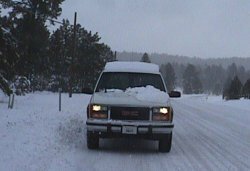 It's about 10-12 miles from downtown Flag on US180, driving northwest toward the Grand Canyon, to the turnoff to the snowbowl. 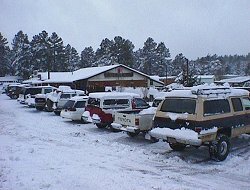 From there, the road climbs steeply up the side of the now-extinct volcano, from the 7500' elevation in the valley floor to the 9,000'+ elevation at the Hart Prairie Lodge parking area, where I would purchase my ticket and join the neophyte snowboarders. The San Francisco Mountains, upon which this skiing facility sits, are the highest remnants of a regional zone of volcanic activity that is currently more or less dormant. The San Franciscos here are the remains of a single massive volcano that must have blown its top a long time ago and left the more or less circular rim of peaks that surround the Kachina Wilderness. 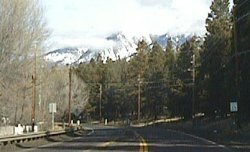 There is Humphreys, the highest peak in all Arizona at approximately 12,633', and Agazziz at 12,356'. The most recent volcanic activity in the area is more than 800 years ago, with the creation of Sunset Crater over to the east about 15 miles. Sunset is an impressive pile of cinder, and dead-beautiful on a lae summer day with thunderclouds all around and the smell of rain and lightning. The last time I'd been to the Bowl, it was June '95, and from there I hiked to the top of Humphreys. It was a beautiful day, the air fairly clear but too many clouds and too much sky-borne moisture to see Utah, and while on the way back down the mountain I was treated to a daytime fireworks show courtesy of the US Army at the Navajo Army Depot, a munitions arsenal west of Flag about 10 miles. I had been feeling and hearing occasional dull thuds during my climb, and on the way back down I had a clear view to the south and got to actually see them lighting off some sort of bomb. This they'd do every 15 minutes or so, and the fireball and resulting concussion a minute or so later were very impressive. So here I am, at the ticket booth at the Ski Bowl, purchasing a snowboard lesson and a lift ticket package. 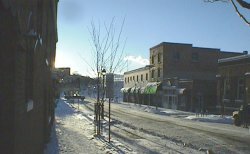 It's a gorgeous day, temperature in the low 40s, and not a bit of wind. There are clouds to the west, a large storm is predicted for later this evening, and there are plenty of people up here sharing the splendid weather and slopes. I find that I'm about 20 minutes late for the lesson, so I grab my ticket and hightail over to the slope between the main lifts to find the rest of the enfant snowboarders. I find Ken first, who directs me to Dave, who appears to be the central focus for the lesson. It is a group of about 15 people, about 50/50 boy/girl, and the ages appear to run from late teen to middle age (me). The talents appear to be fairly broad-ranged also, with boarders who seem to be real adept at this new sport to others who continue to try and try just to stand up. I find myself a spot in the midst of them and learn the fundamentals of clipping in to the board, making sure that I always wear my leash (surfers used to call them "kook cords"), when the board is off and not leashed to make sure it's turned over so the bindings keep it from sliding down the hill and skewering someone. Next it's time to learn the basic moves: first the toe slide, then the heel slide. Remember, you're standing pretty much sideways on a snowboard. Therefore your toes occupy one edge of the board, your heels rests near the other edge. The way you choose to orient them (toes pointed slightly forward and on left edge or on the right edge is your call. In my first attempt at this, I can't honestly say that I find any difference, because I was so bad in the first place. So for me, the right front toe was pointed slightly forward, the left foot was the trailing foot and toed nearly athwartship. If this was supposed to be comfortable, it didn't feel it. I think I have more work to do on establishing the proper foot positioning. So anyway, snowboarding seems to be oriented toward the concepts of direction defined by heel and toe. A heel slide is where the boarder is looking upslope, and the board is slipping sideways in the direction of the heel, or downhill. A toe slide is just the opposite. Actually the first thing taught was how to stand up from a sitting position. That wasn't so difficult, and soon I was toe- and heel-sliding with the rest, and discovering that there was a lot of similarity to skateboarding and surfing, both sports at which I've never been more than a rank beginner. Then next thing to learn was the traverse, which as you might imagine is moving sideways across the slope rather than straight down it. This is a natural consequence of being on a board, and in fact one that can rapidly turn a gentle drift on the board into a major downhill flameout. But soon, we were all (well, mostly all) able to slide downhill, traverse to and fro, and execute the "falling leaf" motion prized by our handlers. Another thing that I quickly learned was that the board goes wherever you look. So, if you wanna go down, look that way. If you wanna stop, look upslope to reduce speed and then level out to stop. Kinda cool, and not the way I remember skiing. Next was the need to learn a real turn. This requires a little forward momentum, then comes the hard part: begin the turn downhillby looking that way, get the weight up on the front foot, as the board begins to point straight downhill, come off the upslope edge and continue to rotate, edgeless, until you aim where you wanna go, then push hard to dig in the upslope edge again. Works like a charm except that nearly all of us when pressed to do it would either not rotate enough so we'd quickly divebomb our way downhill or we'd rotate enough but instead of digging in the upslope edge we'd dig in our toes or heels and fall over. I was firmly established in both camps. I kept thinking of that line in the movie "Better off Dead", where, atop the precipitous mountain, the character Lane Meyer is instructed to "go that way, very fast - if something gets in your way, turn." It's the turning part that's got me stymied. After a few more attempts (and some successful) at turns, Dave and Ken declare us ready for the next episode of learning snowboarding: the ski lift. The ski lift is a particularly tricky thing as the snowboarder is hampered by having to drag a snowboarded foot behind the unshod one. It's like walking with a mammoth clown shoe and not nearly as much fun. 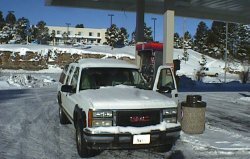 However, I am able to get on the lift without too much difficulty and I meet my liftmate Derrick, a second-time snowboarder and computer science/engineering student at NAU. We spend the next 7 minutes or so discussing our adventures on the board, and I also find out that he's originally from Orange County, Ca, then moved to Phoenix about 4 years ago, then to Flag for school. He indicates that he had not taken a lesson the first time he waso n the board, a couple weeks ago, and had fallen so many times and gotten hammered so hard that it took him a week or two to recover from his injuries. He is convinced this time that he is ready for the rigors of the board, and will have a great time on the mountain today. Finally we reach the top of the lift, I am more or less successful in getting off the lift, and only fall once or twice in doing so. I discover another problem for snowboarders and one that I'm sure gives skiers another chance to blast away at the ranks: the problem of moving on near-flat surfaces while on the board. No momentum, no go. So, out comes one foot and again I slog, neanderthalish, Igorish, dragging the right foot as I limp toward the minor slope that will eventually lead to the real downhill. In so doing, I fall another couple of times, landing on my hands now. Someone's mother is here too, first time on the board, and she has an annoying habit of caroming into me. So I spend about half my time avoiding her and the other half avoiding premature death or dismemberment. Ok, I'm now to the point where the slope begins, I can pick up speed, the shock of the earlier fall is only a dull roar masking my senses, and I begin my slow descent on the hard-pack face of the slope. Note that this is a pretty minor slope, a little more exciting than a bunny slope, no moguls, no particular dangers, the killer trees safely to the sides of the trail. I eventually make it down out of this chute to the top of a vast open area, at least 100 meters wide, and 500 meters long, where I begin with slow traverses and the old falling leaf manuevers and soon get into real turns (ok, really retarded ones, but successful) and bits where I get the confidence to crouch down, surfer-style, and drag a finger in the face of the slope above me while ripping across at a nice clip. Way fun. Nice day. Hey - look at that babe over ----- BLAMMO!! Now I'm really hurting. The pain from this fall, concentrated in my chest (and feeling like a couple of broken ribs), and the pain in my lower back have conspired to make me decide to take a respite from the slope. I board down to the Hart Prairie Lodge, disencumber myself of the board, and go inside to warm up a little and walk off the pain. Saturday evening First I stopped by the Flagstaff Brewing Company and tasted one of their Agazziz ales, then wandered around for a while in the falling snow until I stepped into the Collins Irish Pub, where I had a simple hamburger, a vodka martini and met Chet Green, the publicity director for the local radio stations, and for the pub. It's a small world because 15 years ago he lived a few miles from where I live currently, and he became a success up here, so I suppose there's hope for me! After Collins, I found the Mogollon Brewery over on Agazziz St., met a great bunch of people, had a bar discussion about kilograms and liters and the merits and origins of both the english and the metric systems of measurement. It's not often you overhear a conversation in a decidedly eclectic brew pub that looks like the inside of a garage where the subject of discussion is the difference between weight and mass. Mogollon brews a fine Wapati pale, a good amber and a stout which I did not try. John, a pre-med student at NAU, invited me to a party out south of town. Also, he strongly recommended the Sun Sausage factory down the street as, he said, he was from Wisconsin and knew his bratwurst. Strong praise, indeed! Leaving Mogollon for a while, the next venue was Charly's on Leroux. Just up the street from my favorite Flagstaff pizza haunt, Alpine Pizza, the Cadillac Angels were on stage tonight. No cover, crowded, they were just getting into a serious set of Link Wray tunes when I came through the door. The Cabo Cantina was crowded and disco throbbed and wild women from the crowd were dancing atop the bar. Eventually ended up back at the Mogollon where I danced to some great funk by a local band Short Bus. Bars dry up at 1am here, so after Short Bus closed up the Mogollon, I went for a last stroll around the neighborhood before returning to the hotel. Sunday morning there's over 6 inches of snow on the ground, and the wind blew hard enough during the night that some snow accumulated on the inside sill of the window that was left cracked slightly open for ventilation. I get up late, still in a bit of pain from the bruised chest, but shower and watch a little article on a family of bluegrass singers. What's so interesting about that? They're all Japanese, and live in Japan. Very talented girls. 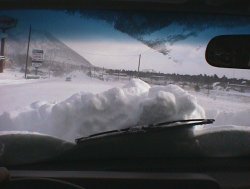 Out at the truck, it is buried with between 5-10 inches of snow on every surface. 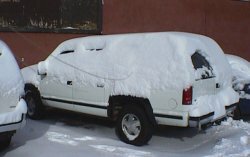 After scraping off the glass, I drop it into 4wd and prepare for my quest for breakfast. It takes me east on old 66 all the way to the east end of town, but I decide not to go to the Crown Railroad restaurant and instead opt for the journey about 9 miles south to Mountainaire and the Mountainaire Tavern. Interstate 40 and then 17 are very snow-paved. The snow, while scraped, still remains as a thin, hard ice layer that has been sprinkled with gravel but holds little traction. So we travel slow, making no sudden movements. At the Mountainaire offramp, a woman in a small Jimmy has apparently attempted an early departure from the freeway by leaving the freeway about 100 yards before the official offramp. She's been here for a while as there's now a tow truck with the driver out scratching his head on the best way to extricate her. I finally find the tavern around 10am, I find a few vehicles outside (worktrucks and jeeps, mostly). This is a good sign. Inside it truly is a tavern, with a long, doglegged wooden bar at one side and a fenced off seating area Dale Earnhardt is leading in the Daytona 500, the menu is good, most of the people here are seated at the bar, having breakfast of just coffee, don't see any alcohol yet. They're all watching the 500, and cheering on their favorites. I have an omelet with sausage, bacon and swiss cheese, a side of a very large fresh buttermilk biscuit and real sausage gravy, and coffee. The food is good, the home-style potatoes especially tasty, the service friendly and attentive, and the bartendress knows all the locals. Note: In addition to the plentiful chunks of sausage, sausage gravy should have plenty of black pepper. Time to pack up and get back on the road. Where to now? Don't know if I want to do the snowboarding thing today - it is much colder out, I still ache enough that moving my torso or breathing deeply hurts. Let's get going and see what transpires. Soon I'm through Flag and about 6 miles west of the I40/17 interchange. Out on a freshly plowed dirt road, I find a wide spot to pull over and park to enjoy the blowing, drifting snow. There are many small black-hooded birds, sparrow-sized, out on the snow, foraging. For what, I don't know. Soon, a woman on cross-country skis shusses past, going south along the road. 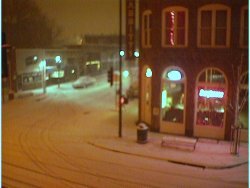 I enjoy the snowfall, watch the BNSF trains rolling past a few hundred yards north, and end up napping for a while. 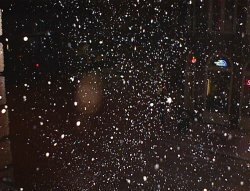 Afternoon falls heavily like the snow. The pain in my chest and lower back makes it difficult to think much, so I go back into town to walk around the streets, maybe take a few pictures and do a little window shopping.